The wealthiest Americans can expect to live at least a decade longer than the poorest—and that gap, as with income inequality, is growing ever wider. New research in the Journal of the American Medical Association shows top earning Americans gained 2 to 3 years of life expectancy between 2001 and 2014, while those at the bottom gained little or nothing. Plenty of research has already shown that health and wealth are intertwined, and that they generally improve in tandem as you move up the income scale. But this year, the vanishing middle class and wildly divergent incomes among Americans have been central issues in a vitriolic race for the White House. Today's JAMA research shows in the starkest terms yet how disparities in wealth are mirrored by life expectancy, and how both are getting worse. Research last year showed that mortality rates are rising among middle-aged whites, largely due to suicide, drug overdoses, and alcohol. That work, by Princeton University economists Anne Case and Nobel Prize winner Angus Deaton, reflected economic stresses on working class whites that have in turn fueled the ascendancy of Republican Donald Trump and his populist message. The latest paper reinforces the idea that inequality in the U.S.—the issue that’s also driven Sen. Bernie Sanders' campaign on the Democratic side—has consequences beyond wealth and income. The authors—economists from Stanford University, the Massachusetts Institute of Technology, Harvard University, consulting firm McKinsey & Co., and the U.S. Treasury’s office of tax analysis—used anonymous Internal Revenue Service data from 1.4 billion tax records over 15 years and matched them to death records from the Social Security Administration. When the researchers looked at how life expectancy changed by geography, there were some bright spots. Among the bottom 25 percent of incomes some regions had longevity gains of more than four years, while others lost more than two years. The differences "suggest that the increasing inequality in health outcomes in the U.S. as a whole is not immutable,” the authors write. The shortest life expectancy in the poorest quartile was in Oklahoma and rust belt cities like Gary, Ind., and Toledo, Ohio. The longest was in cities like New York and San Francisco, with “with highly educated populations, high incomes, and high levels of government expenditures." The geographic differences in life expectancy for low-income people weren’t strongly explained by access to health care, unemployment rates, or housing segregation, the authors write. Instead, lifestyle and behavior were at work: smoking, obesity, and exercise. "Individuals in the lowest income quartile have more healthful behaviors and live longer in areas with more immigrants, higher home prices, and more college graduates,” the researchers found. 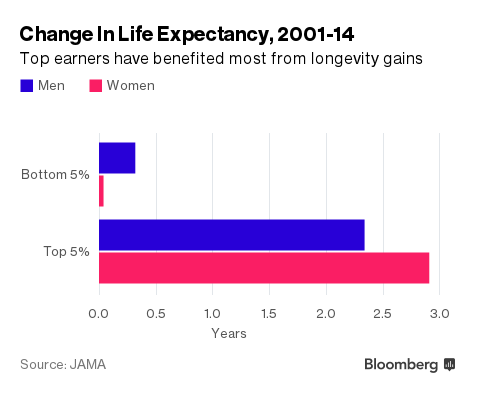 It’s important to note that the relationship between income and life expectancy is complicated. An analysis like this can show associations, but it can’t prove that one factor, like living in a highly educated city, caused people to live longer. “Income is correlated with other attributes that directly affect health,” the authors write, and those attributes aren’t measured in the analysis. Measuring life expectancy at age 40, as this study does, also doesn't capture important measures of health like infant mortality. Angus Deaton, in a commentary accompanying the JAMA research, wrote that "the infamous 1 percent" get an extra 10 to 15 years "to enjoy their richly funded lives and to spend time with their children and grandchildren, and they are pulling away from everyone else. Inequality in health reinforces inequality in income, and perhaps even a longer life is for sale."